Robert Rodi wrote the ELEKTRA series following writer Greg Rucka's stint on the Marvel Knights title. Here we talk about all the storylines he introduced, what was planned before the cancellation and what makes Elektra tick. 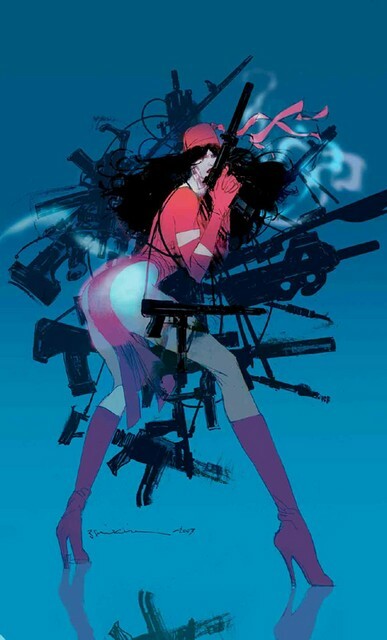 Kuljit Mithra: The ELEKTRA series that came out under the Marvel Knights banner had some interesting explorations of the character. You returned Elektra to a cold-blooded assassin with issue #23, as Greg Rucka before you pulled back for a bit. When you got the chance to write ELEKTRA, was this something you pitched or was editorial looking to move in this direction? Robert Rodi: My directive from Marvel was to reestablish her as the world's greatest assassin, which I was only too happy to do. It's her unique selling point. Without it, she'd basically be... what, Batgirl? Mithra: Your first two issues, "The Mark", and "The Job" set the tone really well, as anyone who has seen the Elektra movie will recognize. It showed how dangerous she really is. Can you briefly describe your plotting of these two issues, as they essentially end at the same place but are told with two different POV's. Rodi: The idea was to show the same hit from the angle of both hunter and hunted. So in the first issue we see it from through the mark's eyes -- in which Elektra is this relentless, almost supernatural force coming after him -- and in the next issue we see it from Elektra's POV; we pull back the curtain and show how she actually did all that miraculous stuff. It was a fun little exercise. Mithra: The next arc, "Power Play" went to the make-believe African republic of Djanda and its leader Bridget Sapanmyas. One thing I liked here was that you told the story again here with two different POV's. I also found the ending quite powerful, as Elektra kills the man who hired her, Beben Oamat, for basically lying to her about his motivation to have Sapanmyas killed. Any comments or thoughts on this arc? Rodi: Yeah, I wanted to get Elektra out of the U.S. and show her operating on an international scale. She's supposed to be the world's greatest assassin, not just America's. Djanda is based on Rwanda, where the conflict between the Hutu and Tutsi tribes erupted into genocide in the 1990s; it was very cathartic to send Elektra into a scenario like that, to nail some of the evil bastards who promoted it. Also, I couldn't remember ever seeing Elektra kill a female victim, and it seemed the perfect opportunity for that as well. Mithra: Were there any issues from editorial with the portrayal of any violence? In this arc Elektra uses a severed head to bypass security. Rodi: Marvel Knights is much more open to the harder-edged stuff. It's why I like writing for that imprint. The regular Marvel line can feel a little constricted, in my opinion. Violence has consequences, and the consequences are bloody hideous. No point pussyfooting around that. Mithra: The next issue "Dead to Rights" ties everything nicely together from previous issues as Elektra gets her revenge on the Paladin group, who had their hands in what we've talked about before, and is actually comedic when they realize she is coming after them over a mistake. While these stories have different titles, did you always consider them as one arc when you were writing it? Rodi: I knew this issue would be Sean Chen's last, so I deliberately set it up as a kind of book-end, thinking it would also make for a nice, solid trade (which it did, when it was all released as ELEKTRA: RELENTLESS). Mithra: How was it working with Sean Chen on your first stories? Rodi: He was great; he always brought a lot more to the table than I asked for. He's a real virtuoso, and a very cool guy into the bargain. Mithra: With "Prophet and Loss", you next took Elektra to the Island of Naou with Will Conrad as artist. What's interesting here is that Elektra kills the belief in the god-like Piaka Loio, which is more powerful than actually killing him. 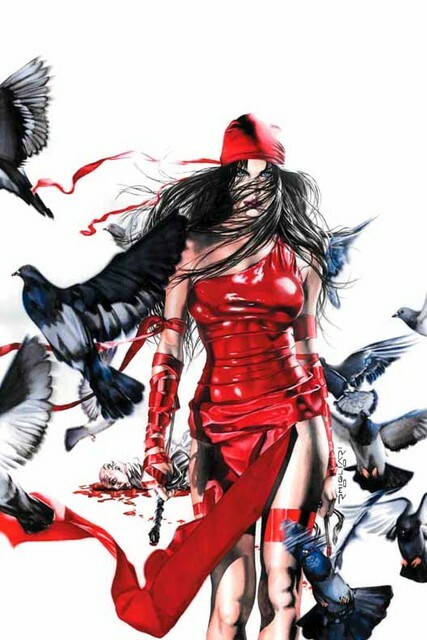 You also explored Elektra's conscience, as she wasn't keen on killing a child. Can you describe the origins of the eastern setting and what about Elektra's character you wanted to explore here? Rodi: I was always trying to push the envelope a little, with every story arc. I'd just had Elektra dispatch a female victim... so I figured, what about a child? But it seemed to me she'd never accept a commission if she knew the hit was a kid, so it had to be a case in which she discovered that later. There's a long tradition in Eastern religions of anointing religious leaders as children, so that seemed the way to go. I was particularly pleased with the resolution to that issue; Elektra killed the Piaka Loio by eradicating all his believers; it wasn't necessary to kill the actual boy who'd held the title. Mithra: You returned Elektra to the US, in New Jersey specifically in "Fever" next, as she is hired to kill Bezzubenkov, a mob boss. Artist Steven Cummings drew this arc. While I don't remember if you used a different POV again, you did leave the revelation of who hired Elektra until the last issue. It may seem like an odd question, but do you find writing the domestic villains more difficult than the "international" villains of the previous arcs? Rodi: I'd always wanted to do a Russian mob story, ever since reading how they'd taken over Brighton Beach. But the real core of this story was turning the tables on Elektra herself. In my first few issues with Sean Chen I'd shown how ruthless and relentless she can be; but she's not superhuman... she's flesh and blood. So for this arc I infected her with a killer flu virus, and then put her through her usual paces. 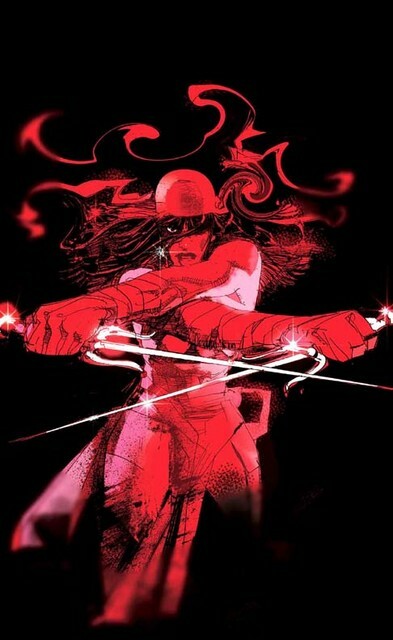 Is a sick Elektra anywhere near as effective as an Elektra in peak condition? As we discover, hell no.but possibly, for that reason, she's even more dangerous. I had a great time writing this arc. Mithra: In what ended up being the last issue of the series, "Dead Reckoning", Elektra details her own history and we learn Matt Murdock still visits her grave every year, even though she is alive. While Frank Miller likes to say Elektra is the kind of girlfriend Daredevil should have (as an equal, not some random "mortal"), what do you think of the relationship before and after her death/resurrection? 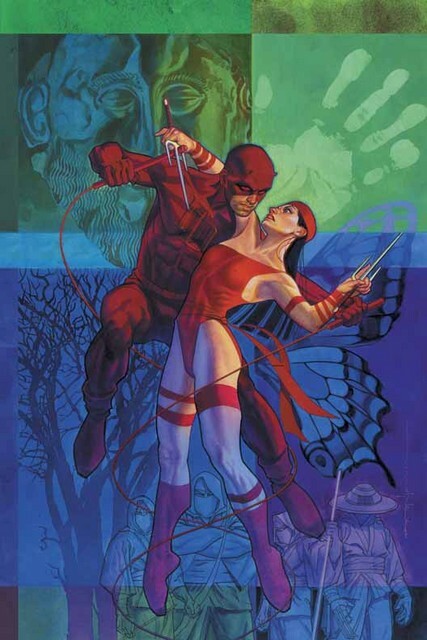 Rodi: I think Daredevil and Elektra are yin and yang; always at odds, yet bound inexorably together. The term "girlfriend" almost trivializes the connection. Especially since, as we've seen, even death can't sunder it. Mithra: Speaking of Miller, did you ever have any concerns about taking on this series? 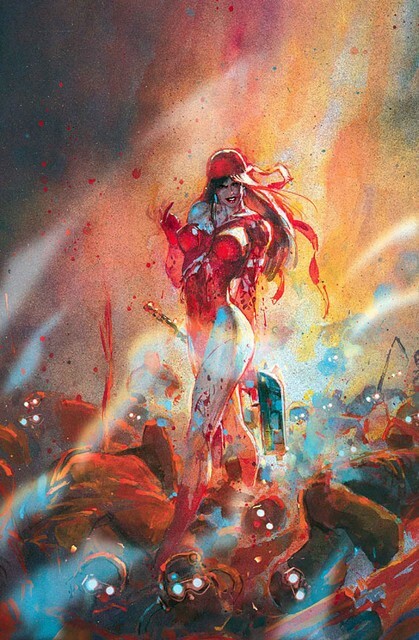 Rodi: Not really; plenty of people had handled Elektra between Miller and me. I wasn't directly taking over his legacy. And he'd already moved on to his own creator-owned projects anyway. Mithra: While issue #35 was the last issue, there was a solicitation for issue #36, where there was going to be a 2-part arc with a mysterious figure from Elektra's past reappearing and Matt Murdock might be helping destroy Elektra without knowing it. Do you remember what you had planned here? When did you know ELEKTRA was going to be cancelled? Did you even start writing it? Rodi: This arc was going to go in an entirely new direction. Elektra was going to discover that while she was dead, her soul had been reincarnated elsewhere. In order to get it back, she'd have to kill the soul's new host. Daredevil was going to try to stop her. I won't tell you how it plays out. I still have hopes of getting this one told, somewhere, somewhen. Mithra: Thanks for taking the time to do the interview. I know you are writing in various forms of media... what is about comics that keeps your interest? Do you have any comics projects coming up? Rodi: I love the collaborative nature of comics, which is very different from my work as a novelist and nonfiction author. And I've been lucky to collaborate with some amazing artists over the years. As for current projects: I've been doing a lot of Thor lately, My ASTONISHING THOR run, with amazing art by Mike Choi, has just been collected in hardcover, and my current miniseries, THOR: THE DEVIANT SAGA, with killer art by Stephen Segovia, is on the stands right now. It brings the Eternals back into the Marvel U.
Mithra: Thank you again, I really appreciate it. Rodi: Thanks for your interest. It was a kick reliving all these stories!